As always, I’ve only included for discussion here the reviews that were marked as belonging to this category. As we all know the genre boundaries are often blurry and many books that could appear here were marked by their reviewers as belonging to other categories such as historical fiction or young adult. But one has to draw a line somewhere right? Ann Turner’s debut novel THE LOST SWIMMER attracted the most reviews with a total of 10. The book depicts what happens when an archaeology professor is accused of fraud then ‘loses’ her husband Stephen during a working holiday in Europe. With a first-person narrative, if you’re a thriller reader, you’re primed to suspect an unreliable narrator. Turner does a good job of laying seeds of doubt as we follow Rebecca’s story as she faces more than one mystery that threatens her happiness. Turner explores the slippery slope we find ourselves on when trust is compromised and secrets are kept. It has often been said that those who mistrust are often the ones with something to hide… so if Rebecca is so determined that something is going on with Stephen, even though she has no proof, what does that say about what’s going on with her? Most reviewers found the novel enjoyable with Brenda summing up sentiments nicely by describing the book as “Tense and gripping, the pace was incredibly fast – it was hard to put down“. Interestingly, more than one reviewer took issue with the book’s publicity as a ‘literary’ thriller, which suggests the tension between popular fiction and literature is ever ongoing as we query why some publishers feel the need to (mis) label their products in this way. The next most-reviewed title was Kylie Kaden’s MISSING YOU which scored 8 reviews. It depicts a love story that goes awry when both parents of Eli, a young boy on the autism spectrum, disappear within a day of each other. The story unfolds from both of their perspectives as well as that of the boy’s grandfather Patrick who is left suddenly to care for Eli. Missing You is Australian author Kylie Kaden’s second novel and delivers an intriguing mystery as well as exploring family dynamics, the difficulties in parenting a special needs child and how quickly things can change when you go from childless to being responsible for someone 24/7. Missing You is a wonderfully crafted story blending the very real issue of caring for a high needs child with a suspenseful mystery. I thought the switching POV worked well and kept the reader fully engaged with all threads of the story. The flashbacks woven into the narrative were also an important tool in giving the reader a true understanding of Ryan and Aisha’s back story and how they have come to such an impasse in their relationship. The voice of Patrick won the hears of our reviewers and the alternating perspective structure was popular too. Deborah at Debbish summed up sentiments well by saying it’s a ‘”fabulous second novel” and noting that it and its characters are better than she anticipated from the back cover blurb. 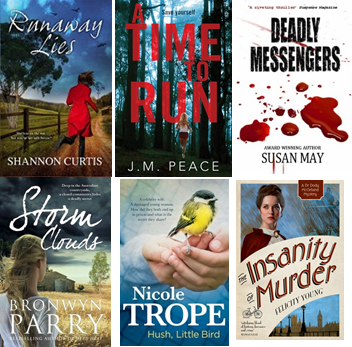 Other books that scored well in the review count were Shannon Curtis’ RUNAWAY LIES and J.M Peace’s A TIME TO RUN with 6 reviews each and Susan May’s DEADLY MESSENGERS, Bronwyn Parry’s STORM CLOUDS, Nicole Trope’s HUSH, LITTLE BIRD and Felicity Young’s THE INSANITY OF MURDER all garnering 5 reviews each. Other popular authors included Rachel Amphlett who had 4 different books reviewed for a total of 10 reviews. Felicity Young also totaled 10 reviews with 5 of those being for earlier releases than her 2015 offering and the ever-popular Kerry Greenwood garnered 6 reviews, each of a different book from among her 30+ published titles. 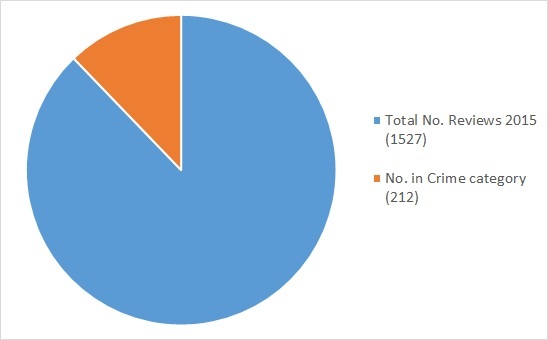 As was the case last year Brenda who reviews at Good Reads was the most prolific reviewer with 42 to her name (and similar numbers in several other genres so clearly a voracious reader). Carolyn, who also reviews at Good Reads, posted 16 reviews in this category and Carol from Reading, Writing and Riesling wrote 12. I wrote the same number but only remembered to link 8 of them for the challenge so my double digit effort doesn’t quite count! 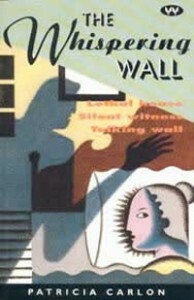 It seems impossible that such a richly drawn story progresses forward almost entirely based on what an immobile woman hears but it is a testament to Carlon’s writing skill that such a narrow perspective provides a more thoroughly gripping read than many of today’s much-hyped blockbusters. This is a genuinely suspenseful domestic setting and seemed to me to be as scary today as it would have been on publication. Alas both of these books are only accessible thanks to modern re-publishing efforts by niche publishers and I remain disheartened at how difficult it is to track down titles of any age by Australian women crime writers. I’ll keep looking though. The Monkey’s Mask is gritty, exciting & passionate. Not one single word is out of place. Porter’s words have captured me – they will haunt me for years to come. I am not done with her yet! I am pretty sure there wasn’t a single review of a true crime book written by an Australian woman writer submitted for the 2015 challenge (we don’t have a separate tag for that so I may have missed something, if so I apologise). I prefer my crime reading to be of the made up kind so I can’t chastise anyone else for not reading in this sub genre but I do wonder if there is a reason that we collectively don’t seem drawn to these stories. Something to ponder. And that wraps up another year of reading and reviewing Australian women crime, mystery, thriller, detective and suspense writers. Hope you’ll all join us again in 2016 and if you’ve already read all of the above books you might start browsing the Challenge’s database of reviews for some other titles to look for. I’m Bernadette Bean. I’ve been reading avidly for as long as I can remember, blathering about the subject since late 2008 at Reactions to Reading, am co-host of Fair Dinkum Crime, a site devoted to promoting and discussing Australian crime fiction, and have twice been a judge for a national crime fiction award. I’ve been wrangling the crime category of the AWW challenge since 2012. Thanks for the great round-up Bernadette. 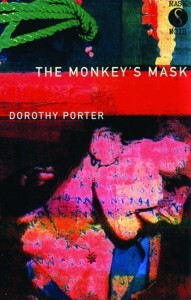 The Monkey’s Mask still haunts me nearly a year later! I wonder if women don’t write a lot of true crime because, sadly, they’re usually the victims of the said true crimes. Could Helen Garner’s This House of Grief be sub-categorised as true crime? I was going to ask the same question, Brona. I think This house of grief has at least a foot in the True Crime camp, but would be interested in Bernadette’s response. Great round-up Bernadette. I love that your most reviewed book was a debut novel too. Wonderful to see brand new authors getting promoted and read. I was fascinated by your comments about classification. 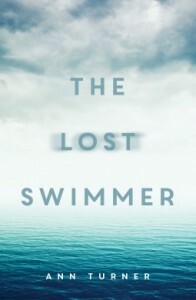 THE LOST SWIMMER may have been marketed as literary thriller but AWW reviewers didn’t mark it that way as it didn’t appear on my lists, while Kaden’s MISSING YOU did. Not knowing either book, I’d be interested to know what you think. Meanwhile, like you, I was pleased to see June Wright added to our challenge. Hadn’t heard of her before. Several of June Wright’s books were re-issued in the last couple of years by a great indie publisher called Dark Passage. I don’t know if they’re going to do all 7 of her novels but I hope so (think they’ve done 3 so far including one that had never previously been published). Oh don’t apologise ! I haven’t yet read the most reviewed book in my category either. Indeed I’ve very happy to be in good company! Brona, I think I might have do some serious digging into this issue because normally people write about what they know so you would think that there would be some women who write about true crime having had direct experience. Maybe they choose fiction in which to tell their stories though. Or maybe it’s another unconscious bias issue where true crime involving men – as participants and/or victims – has more selling power? I don’t know enough about the genre to do anything other than speculate at the moment but it’s made me curious. As for Helen Garner’s book I haven’t read it (am waiting in the library queue) but those who have read it for this challenge have all classified it as non-fiction. Perhaps because we don’t have a specific label for true crime or maybe that’s just not how they see it. Hi Bernadette, some reviewers for the challenge, including me, labelled The House of Grief as “true crime” under form, so in our database it is recorded as “true crime”. You don’t see that in some of the searches though!